Wow this Summer has flown by. Not that it really matters for us since we unschool and learning happens all the time...even during the Summer. 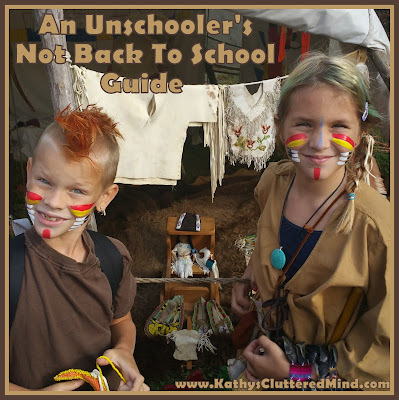 But believe it or not even unschoolers need to prepare for a new "school" year. So what does an unschoolers "not back to school" preparing look like? Well it is definitely not stressful and is basically a time for us to regroup. Here are some of the the things that occur when we are getting ready for a new "school" calendar year! Make a list of everything the kids want to learn about and explore during the year. This list definitely grows throughout the year, but it's helpful to have a good launching point. This list includes everything the kids are interested in learning about whether it is dinosaurs or shrunken heads! Buy some books, because you can never have enough books! We utilize the library every month and check out around 100 books a month (on average) but we also like to add a few books to our personal library. Our two favorite publishers are National Geographic and Usborne. Load up the Netflix queue with educational programming that compliments what the kids want to learn about. Yes the television is a resource in our home. Netflix and Amazon Prime are loaded with fabulous, educational documentaries and movies. Clean out the "homeschool room" or as I like to call it our resource room. I know Spring is over, but it is better late than never to go through that dreaded room (you all know what room I am talking about) to organize and purge. I did ours a few weeks ago and it felt wonderful. I got rid of several boxes of resources we no longer utilize and gave them to a homeschooling family that is starting their first year! Fill up the calendar with experiential learning experiences, fieldtrips and camping trips. If you follow me you know I run the largest homeschool group in the Southeast USA. So not only am I busy finding and creating amazing experiences for my children, but I am also busy helping out other families too! Celebrate! Get together with homeschool friends and celebrate with a "not back to school" party! After all Summer is NOT officially over yet and we still have a couple months to enjoy it with "hot" weather activities like swimming at the lake! Several bloggers have gotten together to host a great giveaway for you just in time for back to school! 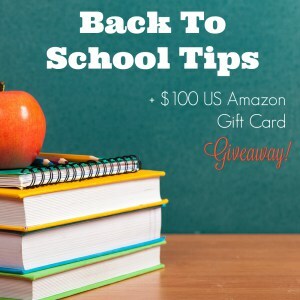 One lucky winner will receive a $100 US Amazon Gift Card . Giveaway ends 8/1/16 and winner will be announced 8/2/16. Please enter via the rafflecopter below.